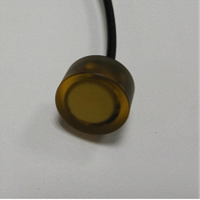 The ultrasonic transducers are a piezoelectric ceramic device that realizes bidirectional conversion of mechanical energy and electrical energy through a piezoelectric effect. Its propagation speed is 344m / s (25 degrees). The operating frequency is generally between 20kHz and 200kHz. The distance and relative velocity of obstacles are determined by reflection and doppler effect. 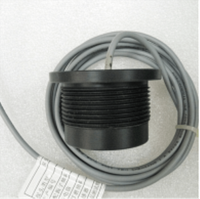 The detection distance is generally between 1 m and 2 m. It is widely used in product systems such as reversing sonar, anti-theft alarm, flow meter, parking timing, and automatic door. The detailed workflow of the ultrasonic sensor system as follows: the controller drives the ultrasonic sensor (transceiver integrated and integrated) through the driving circuit to generate a short, fixed-frequency ultrasonic signal through piezoelectric conversion, when the ultrasonic pulse encounters an obstacle. The reflection will occur, the receiving sensor will receive the reflected mechanical echo, and then through the piezoelectric transformation, after the echo electrical signal is processed by amplification, filtering, detection, etc., according to the transmitted ultrasonic wave and the received reflected echo. The time interval is calculated to the distance between the sensor and the obstacle. The following is some of its main parameters: Sound pressure characteristics, sound pressure (SPL) is a parameter indicating the volume of the sensor's emission. 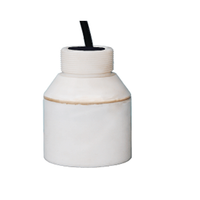 It is expressed by the following formula: SPL=20logP/Pre(dB) “P” is the effective sound pressure, “Pre” is the reference sound pressure (2×10-4ubar), and the sound pressure of the ultrasonic sensor is generally ≧100dB. Set a shielding box, put a standard test rod in the farthest detection distance position (1.5m ~ 2m) specified in the shielding box, generally ¢75mm PVC pipe, put the sensor module to be debugged into the test frame ,it is connecting the oscilloscope. Power on the system, adjusting the adjustable mid-week of the sensor board, so that the equivalent capacitance inside the middle and the sensor will generate resonance at a specific frequency and reach the optimal point; then debug the echo sensitivity of the distance measuring transducer sensor (generally through the adjustable resistor) ), observe the echo width of the obstacle through the oscilloscope to the required value. 1. After completing the sensor ranging function test, to verify the sound pressure and envelope range of the ultrasonic range finding sensor. The sensor can continuously emit ultrasonic waves in this mode; five spatially distributed high-frequency microphones are set outside a certain horizontal distance (30-40 cm) from the test sensor, and the ultrasonic signals emitted by the sensors are collected by five high-frequency microphones to judge and analyze. 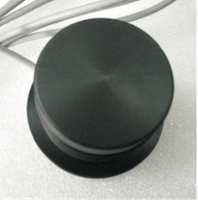 The sound pressure level of the ultrasonic wave and the position of the microphone calibration determine whether the sensor beam angle (envelope range) meets the index requirements. 2. After completing the above test, the sensor's receiving sensitivity index test is performed. The sensor enters the continuous receiving state in this mode, and sets a transmitting sensor outside a certain horizontal distance (30 to 40 cm). The transmitting sensor emits an ultrasonic signal that calibrates a certain sound pressure level (simulating the echo signal intensity emitted by the obstacle), and the ultrasonic signal emitted by the transmitting sensor is received by the receiving sensor to be tested, and the piezoelectric conversion and signal amplification are performed in the sensor. Then connect to the acquisition card for data analysis, analyze whether the sensor can receive the echo signal under the sensitivity condition, and test whether the sensor receiving sensitivity meets the test index requirements.
. The inside of the box is covered with sound-absorbing cotton to prevent interference from other sound waves during testing. There are fixtures for sensor test position in the box. There are 5 high-frequency microphones and one at the bottom of the box. About launch sensor. They are used to test the sound pressure, envelope range and echo sensitivity of the ultrasonic sensor to be tested. 4. The sensor needs to have three test modes, which can realize mode conversion by communicating with the host. 5, Continuous transmission mode, in which the sensor can continuously emit ultrasonic waves through the test without echo reception; in this mode, the ultrasonic signals emitted by the sensors are collected by five high-frequency microphones to judge the sound pressure of the ultrasonic waves. The level and the position of the microphone calibration determine whether the sensor beam angle meets the index requirements. About receiving mode, the sensor enters the continuous receiving state through the test host in this mode, and does not emit ultrasonic signals; in this mode, the ultrasonic signal (simulated echo signal) of a certain sound pressure level is passed through the calibrated sensor, and the collecting card is passed The signal received by the sensor is collected to analyze whether the ultrasonic distance measuring transducer sensor can receive the echo signal under the sensitivity condition, and whether the sensor echo sensitivity satisfies the test index. 3) Normal working mode, which is mainly used for testing other common parameters of the sensor. The high-frequency microphone uses the measurement microphone with a frequency range of up to 100 kHz. The sensor envelope range (beam angle) is tested by the position of the five microphones. High frequency microphone signals are acquired by the acquisition module to analyze the frequency and signal strength of the acquired ultrasonic signals. 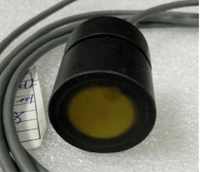 Through the above tests, the performance indicators of the ultrasonic sensor can be measured more comprehensively, such as the sound pressure, the receiving sensitivity, the detection envelope and the like; and the tooling can be made smaller (length 30-40 cm); the traditional method of test fixture needs to be 1.5 to 2 m long, which takes up space.